Knowledge graphs (KGs) are large scale multi-relational directed graph, which comprise a large amount of triplets. Embedding knowledge graphs into continuous vector space is an essential problem in knowledge extraction. 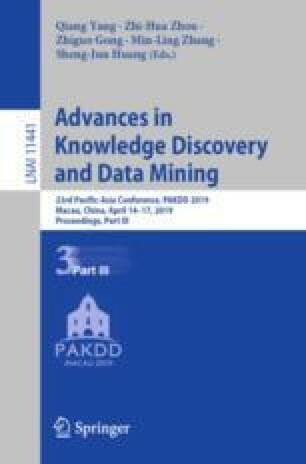 Many existing knowledge graph embedding methods focus on learning rich features from entities and relations with increasingly complex feature engineering. However, they pay little attention on the order information of triplets. As a result, current methods could not capture the inherent directional property of KGs fully. In this paper, we explore knowledge graphs embedding from an ingenious perspective, viewing a triplet as a fixed length sequence. Based on this idea, we propose a novel recurrent knowledge graph embedding method RKGE. It uses an order keeping concatenate operation and a shared sigmoid layer to capture order information and discriminate fine-grained relation-related information. We evaluate our method on knowledge graph completion on benchmark data sets. Extensive experiments show that our approach outperforms state-of-the-art baselines significantly with relatively much lower space complexity. Especially on sparse KGs, RKGE achieves a 86.5% improvement at Hits@1 on FB15K-237. The outstanding results demonstrate that the order information of triplets is highly beneficial for knowledge graph embedding. This work is supported by the National Key Research and Development Program of China, and National Natural Science Foundation of China (No. U163620068).